Congratulations are in order for George Throop who was our couch surfer for one night. He FINALLY reached the Atlantic Ocean, Coney Island on foot today, in just over 10 K after starting on the west coast, Vancouver, Washington! He’s started and stopped this journey since 2009. My husband Jason got to walk ten miles on his journey during the first snow storm of the season from Doylestown to Buckingham, PA on Saturday December 7, 2013. 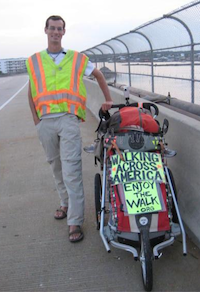 —> Folks keep on moving forward even if your dream is over 3,500 mile. Every step counts!